Plastic free bottlebrush. 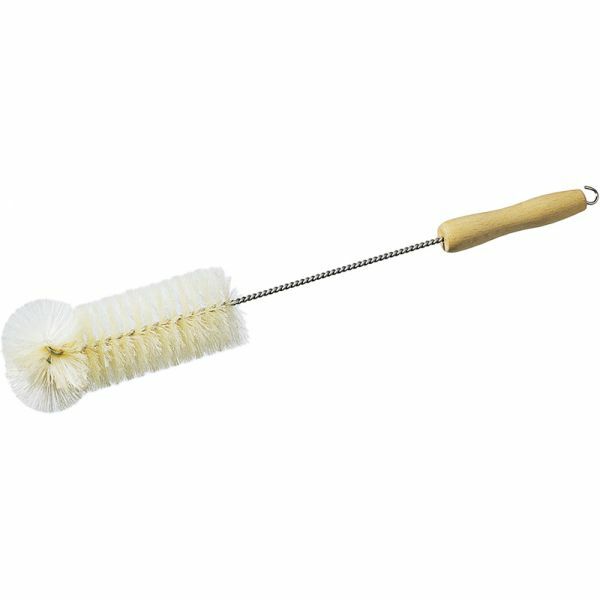 Pure light natural bristles with a wooden handle. A natural bottle brush total length 430 mm. Brush part - 58 mm x 155 mm long. Pure light natural bristles with a wooden handle. Plastic free brush. Made from locally grown beech wood, metal and pure light natural pig hair. The beech wood is FSC certified in accordance with the strict guidelines of the Forest Stewardship Council. It doesn't fit through the regular bottle's mouth. It's perfect for cleaning water bottles and baby bottles. At first a few strings came out, but not any more. The bristles are so soft, they don't scratch at all. The handle is also long enough. Although I needed a regular bottle cleaner, I'm glad that I've bought it as I wanted to change my old plastic water bottle cleaner as well.